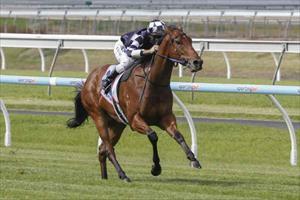 Victorian two-year-old Bullpit led all the way to win Saturday’s Listed Queen Adelaide Stakes (1050m) at Morphettville and in the process provided little known Zabeel stallion Speed 'n’ Power posted his first stakes-winner. Prepared by Danny O’Brien, Bullpit won at Moonee Valley two starts ago before finishing fourth to highly regarded Pressing at Caulfield. Sent across to Adelaide for his first crack at Black Type, Bullpit led all the way for jockey Michael Rodd and despite racing greenly to the line held on too well to win the 1050 metre scamper by more than a length. Rodd said Bullpit was a real speedster and was suited by the way the race was run. "He’s a real speed machine and when he got an unchallenged lead like that then I knew he’d be hard to beat,” he said. Bullpit won over 1000 metres at Moonee Valley but was unplaced over 1200 metres at his last start at Caulfield and Rodd said that the minimum trip was his forte at present. "He’s a real runner and he’s strong at the 1000 so today’s race was ideal for him,” Rodd said. Not offered at auction, Bullpit has won two of four starts earning over $100,000 in prizemoney for lucky owner Steven Pitts. Bred by Paddy Hare, he is the first foal of Madamesta, a half-sister by Estambul (Arg) to stakes-winner Riceman. Madamesta has been to Speed 'n’ Power twice since producing Bullpit so has a yearling filly and weanling colt to follow that are full siblings to the stakes-winner. Bullpit is the best of five winners from nine foals to race for Speed 'n’ Power, whose oldest progeny are four year-olds. Standing at Tulla Stud in New South Wales for Paddy Hare, Speed 'n’ Power has only covered small books of mares so to get a stakes-winner is quite an achievement. A blue-blooded son of champion sire Zabeel, Speed 'n’ Power made $1.6 million as a yearling, but never raced due to an infected pedal bone. Closely related to champion racehorse Might and Power, Speed 'n’ Power is from stakes-winner Miss Power Bird, a half-sister to Champion HK Miler and sire Lucky Owners and to the dam of four-time Group I winner Mosheen.